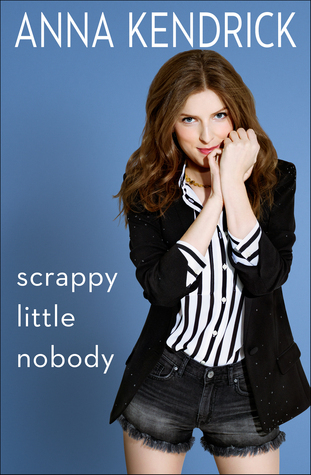 There's nothing better than an audiobook that is read by the author, so I was very excited to have the opportunity to listen to Scrappy Little Nobody. I don't follow Anna Kendrick on Twitter, but I've seen a few of her tweets as they've been retweeted here and there, so I was kind of familiar with her style of humor. This was a fun book. Anna is very down to earth - she sounds like the kind of gal you'd want to go to the bar with for happy hour and throw back a few $2 local brews. It was refreshing and eye-opening to hear her experiences with big fame events like the Oscars, press junkets, and Twilight. Some parts of her life were definitely glossed over, and I'm guessing that was intentional? For example, she was in New York and then suddenly she's in L.A. with no real explanation on how? And then toward the end, there is a whole section on party planning that just straight up felt like, "this book isn't long enough because you're really not that old and we need some filler material." Same with the story about Buccaneer Days. I understand the significance of the experience, but it seemed like a really long story for the little point she makes about it. But these are minor quips. Overall, I really enjoyed hearing about Anna's life and Anna's philosophy on her life. After reading this, I'll continue rooting for her to do awesome things, and maybe win the Oscar this time. I definitely recommend doing the audio if you can. Anna is expressive when she talks, and I think hearing how she says things placed them differently in my mind that my own reading voice would have done. Thank you to Simon & Schuster for sending me a copy of this audiobook in exchange for my honest review. Hahah I loved "you're really not that old and we need filler material." I didn't really think about that, but it's true. Anna is a little young and while she's been in a lot, I feel like she doesn't have the same level of experience that most people do when they write a memoir. Great review, though. I've been very curious about this book.